Introduction: Lumbar disc herniation is one of the main causes of discogenic low back pain and reported to affect 60%–80% of people during their lifetime. The two main surgical modalities for intervertebral disc surgery are standard open discectomy and minimally invasive discectomy which include percutaneous endoscopic lumbar discectomy and microendoscopic discectomy (MED). We report our experience with the same technique of MED to evaluate the efficacy of MED for lumbar disc pathology. Aims and Objectives: The aims and objectives were to study the efficacy, advantages, and associated limitations and complications of MED in lumbar disc herniations. Materials and Methods: This study was carried out on 300 patients who had single-level herniated disc. The procedure was done by Microscopic Endoscopic Tubular Retraction System. Preoperative assessment of Visual Analog Scale (VAS) and modified Suezawa and Schreiber (MSS) clinical scoring system was documented 1 day prior to surgery. Postoperative results were determined to be excellent, good, fair, or poor according to MacNab criteria and also evaluated by MSS clinical scoring system on postoperative day 7 and after 6 months. Results: A total of 187 patients were males and 113 patients were females and a majority of patients were in the age group of 31–40 years. A total of 192 patients had disc herniations at L4–L5 level. The mean operative time was 82 min and the mean hospital stay was 5.3 days. Eighteen cases (6%) developed postoperative complications including discitis, dysesthesia, recurrent prolapsed intervertebral disc, residual disc, dural tear, and nerve root injury. Mean preoperative VAS score was 8.7 and the mean postoperative VAS scores at postoperative day 7 and at 6 months were 2.25 and 1.12, respectively. The mean preoperative MSS score was 3.27 and the MSS scores at postoperative day 7 and at 6 months were 7.42 and 8.2, respectively. The overall successful outcome of the endoscopic discectomy after 6-month follow-up on the basis of VAS improvement percentage was 87.6%, MSS scoring percentage was 91.6%, and MacNab scoring percentage was 92.67%. Conclusion: MED is a safe and effective technique. It offers decreased blood loss, shorter operative time, shorter in-hospital stay, decreased need for pain medication, decreased rate of infection, and a shorter return to work time. Limitations of this technique include a learning curve which is related to surgery time, complications, conversion to open procedures, and recurrent disc herniation. The difference between conventional open surgeries and minimally invasive surgeries is the mode of access. Minimally invasive surgeries should have comparable or better outcome than conventional surgeries, but the access pathway should be less traumatic and should preserve the normal anatomy as much as possible. In 1997, Smith and Foley introduced the MED system, which enabled symptomatic lumbar nerve root decompression by using an endoscopic, minimally invasive surgical approach., The second-generation MED system was developed in 1999 called the Microscopic Endoscopic Tubular Retraction System (METRx) (Medtronic Sofamor Inc., Memphis, TN, USA). MED performed via blunt muscle splitting approach is characterized by less postoperative pain, shorter hospitalization, and faster return to work. However, MED has limitations as well. It is more expensive and has a long learning curve as it requires advanced technical expertise and specialized equipment and increased intraoperative exposure to radiation. Some studies also report potential nerve root injury because of the limited exposure. 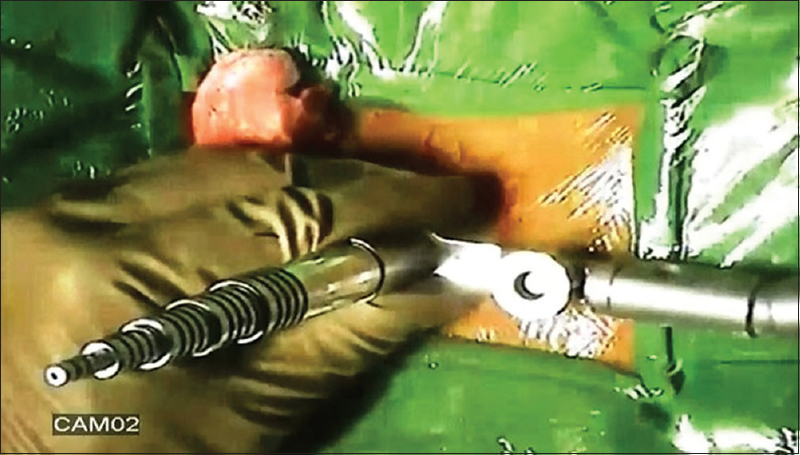 In India, Ranjan and Lath, Garg et al., and Jhala and Mistry have reported the use of METRx tubular system for discectomy with an endoscope. Kaushal and Sen have reported their results with Destandau endoscopic technique. Kulkarni et al. in 2014 are the first in India to have published their study of combination of METRx tubular system with a microscope in a large series where they have used this system in 188 patients. We report our experience with the same technique of MED to evaluate the efficacy of MED for lumbar disc pathology with respect to advantages, limitations, and complications of the procedure and clinical outcome. To study the complications associated with the procedure. This prospective study was carried out on 300 patients who presented to the neurosurgery outpatient department. Patients with clear clinical signs of nerve root irritation with/without low back pain, neurogenic claudication, a history of exercise intolerance, persistent pain despite 6–8 weeks of conservative treatment and positive tension in both straight and crossed leg raising tests, and clinicoradiological correlation with magnetic resonance imaging and computed tomography were included in the study. Exclusion criteria were disc protrusion without radiculopathy, pyogenic discitis or other infections, neoplasm, spondylolisthesis, rheumatoid arthritis, degenerative spinal canal stenosis, cauda equina syndrome, reoperations, herniated discs involving more than one spinal level, and known psychological disorders. Conservative treatment included bed rest for a short period of time with restriction of lifting, bending, climbing, and heavy exertional activity. All patients were prescribed nonsteroidal anti-inflammatory drugs, muscle relaxants, and standard physiotherapy including microwave or shortwave diathermy and exercises. After the diagnosis was made, all patients included in the study and their relatives were informed and explained about the surgical management. The procedure was done by METRx [Figure 1]. Written informed consent was taken from all the patients included in this study. Preoperative assessment of Visual Analog Scale (VAS) and modified Suezawa and Schreiber clinical scoring system (MSS) scoring systems was documented 1 day prior to surgery. All the patients were operated under general anesthesia with nil by mouth status overnight. Postoperative results were determined to be excellent, good, fair, or poor according to MacNab criteria and also evaluated by MSS score on postoperative day 7 and after 6 months. Second-generation METRx endoscopic instrumentation was used. It consists of a guidewire, a series of sequential dilators, a tubular retraction system, a rigid microscope, and a standard video monitor system [Figure 1]. The patient is put in prone position with bolsters below the chest and iliac crest and precautions are taken to prevent compression of the abdomen and to facilitate opening of the interlaminar window with head end raised and pressure points well padded. The surgeon stands on the side of the herniation. A paramedian skin incision is taken about 2 cm lateral to the spinous process. Incision is taken about 0.9–2.2 cm depending on the selected working trocar. The skin incision should not be too short as it makes the insertion of the working sheath very difficult and also carries a risk of skin ischemia. The next step is to open the muscle fascia with a sharp knife to prevent compression of the paravertebral muscles at the tip of the work sheath by subsequent dilatation and insertion of the working sheath. After puncturing the muscle fascia, the smallest dilator is inserted in direct contact with the bone. Continuous fluoroscopic guidance and constant contact with the bone will help to avoid the complications of accidental opening of the spinal canal due to perforation of the lamina or interlaminar window. The initial dilator is used to sweep off the paraspinal muscles and palpate the bony landmarks. Sequential dilators were then inserted while confirming the target site under fluoroscopy [Figure 2]. The final tubular retractor, which was 18 mm in diameter, was then docked with the flexible arm as the final working channel. Once the working channel is inserted, surgery is done by the manual technique with the help of a microscope. The remnant connective tissue is removed to expose the bony part of the lamina. The ligamentum flavum is identified at the inferolateral edge of the superior lamina. The ligamentum flavum is either directly exposed if feasible through the interlaminar approach or further opening of the window is done with a Kerrison punch. A diamond burr can also be used for this step. The next step is opening of the ligamentum flavum which is done with a knife or hook and if required, the neighboring laminar bone is removed with a punch or diamond drill to enlarge the interlaminar fenestration. Following this, the epidural fat tissue is removed, and the dura and the nerve roots are identified. Further, interlaminar fenestration is done up to the lateral recess and further bone removal depends on the necessity of the exposure which is done with the help of a Kerrison punch. The sequestrated disc is identified and removed with the help of disc-holding forceps with care taken to avoid any tension on the nerve root [Figure 3]. In addition, some amount of disc from the disc space can be evacuated [Figure 4]. Dural sac and nerve root decompression is achieved which is further confirmed by the evidence of epidural bleeding. After achieving the decompression, the trocar is to be removed and hemostasis is to be achieved in the muscles and fascia to prevent intramuscular and epifasical hematoma. In the postoperative period, injectable broad-spectrum antibiotic was given to all the patients for 3 days. Patients were discharged on the 4th or 5th postoperative days depending on the patient outcome and were called for follow-up and suture removal on the 7th postoperative day. The patients were ambulated immediately from day 1 onward. Regular follow-up was done on days 1 and 7 and 6 months for all patients. Various assessment scores (VAS, MacNab, and MSS) were documented on postoperative day 7 and after 6 months of follow-up to evaluate the surgical outcome. MSS clinical scoring system was used to evaluate pre- and post-operative results. 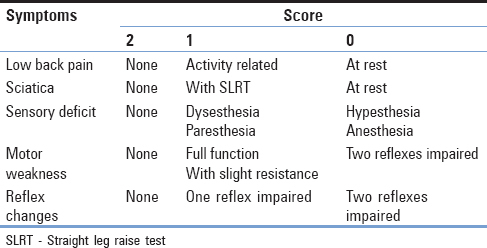 The total score is calculated by adding the score from each symptom for a maximum of 10 and a minimum of 0. A total score of 9–10 indicates excellent condition, 7–8 good, 6–5 moderate, and 4 or less poor [Table 1] and [Table 2]. Out of the 300 patients in our study, 187 patients were males and 113 patients were females and a majority of patients were in the age group of 31–40 years. A total of 192 patients had disc herniations at L4–L5 level, 27 patients at L4–L4 level, and 81 patients at L5–S1 level. The mean operative time was 82 min with a range of 62–80 min and the mean hospital stay was 5.3 days. Out of the 300 patients who underwent operation for (LDH)Lumbar disc hernations in our study, 18 cases (6%) developed postoperative complications, out of which 2 developed discitis and 2 were found to have dysesthesia. Furthermore, recurrent prolapsed intervertebral disc was seen in six cases where all the patients had a symptom-free period of 3–6 months and later underwent fusion. There were four cases with residual disc and all had a successful revision MED. Dural tear was seen in three patients which were managed with fibrin glue injection and immobilization and head low position. Nerve root injury was seen in one patient. VAS – mean preoperative VAS score was 8.7 and the mean postoperative VAS scores at postoperative day 7 and at 6 months were 2.25 and 1.12, respectively. Out of the 300 cases, 2 cases of discitis and 1 case of dysesthesia did not show much improvement in their VAS on postoperative day 7, but showed symptomatic improvement on conservative treatment on 6-month follow-up. The six cases of recurrence and four cases underwent revision surgeries and had postoperative improvement in their VAS score at 6-month follow-up. MSS Score for lumbar disc disease – the mean preoperative MSS score was 3.27 and the MSS scores at postoperative day 7 and at 6 months were 7.42 and 8.2, respectively. According to the MSS scoring at 6 months, 82 patients (27.3%) and 193 (64.3%) had excellent and good outcomes, while 18 patients (6%) and 7 patients (2.3%) had moderate and poor outcomes, respectively. According to the Modified MacNab criteria, 84 patients (28%) and 174 patients (58%) had excellent and good results, respectively, at postoperative day 7, which improved to 132 patients (44%) and 146 patients (48.67%) at 6-month follow-up, whereas 24 patients (8%) and 18 patients (6%) had fair and poor outcomes each at postoperative day 7 which changed to 9 patients (3%) and 13 patients (4.3%), respectively, at 6-month follow-up. The overall successful outcome of the endoscopic discectomy in our study was evaluated after 6 months of follow-up on the basis of (a) VAS improvement percentage = 87.6%, (b) MSS scoring percentage (overall excellent and good cases at 6-month follow-up) = 91.6%, and (c) MacNab scoring percentage (overall excellent and good cases at 6-month follow-up) = 92.67% (excellent and good scores were considered as successful outcome). Prior to the introduction of minimally invasive techniques, open discectomy was considered as the gold standard treatment of herniation. The various disadvantages of this technique were destruction of the normal anatomy of the posterior elements of the spine, segmental instability, and long-term distress.,, To avoid these complications of open surgeries, minimally invasive spinal surgeries were introduced and gradually new instruments to aid this procedure were developed. In our study, we evaluated the efficacy of this technique as a treatment of choice in the Indian scenario. It was done on the basis of evaluating successful outcome and complication rates. In our study, the surgical time for MED was longer in the initial cases, reflecting the learning curve, and progressively decreased thereafter. The mean operative time of MED in our study was 81 min with a range of 72–98 min. A similar study carried out by Garg et al. had reported a mean operative time of 84 min. Most studies on MED report operative time of 40–120 min. The various complications documented in literature are wound infection, cerebrospinal fluid (CSF) leakage due to intraoperative dural tear, nerve injury, vascular injury and bleeding, and postoperative epidural hematoma. Many studies have mentioned a disadvantage of potential nerve root injury and recurrence because of limited exposure. The recurrence rate is expected to be higher than conventional open discectomy since less disc material is retrieved. However, the recurrence rate in our study was only 2%. The various complications encountered in our study were discitis, discogenic low back pain, recurrences, dural tear, nerve root injuries, and dysesthesia. The overall complication rate was 6%, which was comparable to a similar study by Jhala and Mistry. There were six cases (2%) of recurrent discs and four cases (1.33%) of residual discs. Revision surgeries were required for these cases in the form of fusion procedures and revision MED. The overall reoperation rate was 3.33%. The reported reoperation rates in literature range from 3% to 14%. Incidental durotomies and CSF leaks have an incidence in literature varying from 1.9% to 9.4%. In a meta-analysis by Dasenbrock et al., they concluded that incidental durotomies occurred more often during MID and this was related to the limited exposure and poor depth perception and also to the learning curve associated with the procedure. Incidental durotomies are a potential complication of any spinal surgery. The incidence of durotomy in our study was 1%. 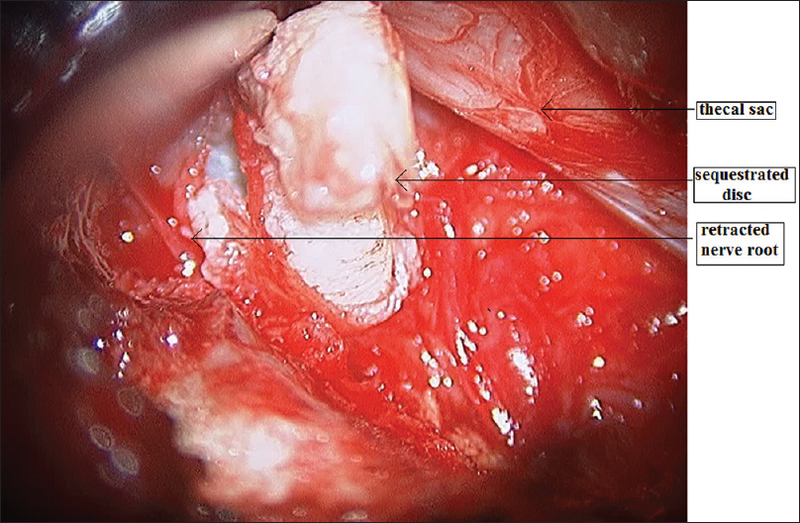 Durotomies encountered in minimally invasive surgeries are typically managed by placing fibrous adhesive substances over the dura mater followed by tight closure of the fascia and skin, occasionally accompanied by bed rest.,, Other techniques documented are primary repair through the tubular retractors, which is very difficult, closure using a laparoscopic knot pusher, and placing a self-closing U-clip device. Most of the complications can be treated with expert hands, provided the surgeon is familiar with open techniques to treat complications and failures. As the study progressed, the operating time, dural tears, and bleeding decreased. This was due to improvement in knowledge and skill with increasing number of cases. Other variables that influence the learning curve are familiarity with the instruments, apprehension of the three-dimensional orientation, and better knowledge of the anatomical structures. VAS was used as a parameter to study the preoperative, postoperative, and follow-up (6 months) outcomes of surgery. Mean VAS preoperative, postoperative, and follow-up scores were 8.7, 2.25, and 1.12, respectively. Our study results are comparable with the results of MED by Wu et al., in which mean VAS changes were significant. MSS score was used preoperatively and postoperatively to assess the successful outcome of our procedure. Results that were excellent and good were considered to be successful outcome. In our study, 82 patients (27.3%) had excellent and 193 (64.3%) had good outcomes on 6-month follow-up, whereas 18 patients had moderate and seven patients had poor outcomes. The mean clinical score calculated from the scoring system was 3.27 in the preoperative period and 8.2 on 6-month follow-up. Thus, the successful outcome on the basis of MSS scoring was 91.6%, which indicated significant postoperative improvement. MacNab criteria were also used to assess the outcome of the procedure. In our study, 44% showed excellent and 48.67% had good outcomes with a successful outcome of 92.67% at 6-month follow-up. Fair outcome was seen in 3% and poor outcome was seen in 4.3% of the patients. In a similar study carried out by Jhala and Mistry, the successful outcome was 94% and in a study carried out by Perez-Cruet et al., the successful outcome by MacNab criteria was 91%. The METRx system can be used both with a microscope and an endoscope. The microscope system which was used in our study enables utilization of both hands due to which two separate instruments can be used for dissection simultaneously. However, the limitations of MED include a learning curve, specialized equipment, and specific training., According to literature, a surgeon should perform at least thirty procedures in order to be skilled and know the pitfalls. MED is a safe and effective technique for treatment of degenerative lumbar spine diseases. It offers decreased blood loss, shorter operative time, shorter in-hospital stay, decreased need for pain medication, decreased rate of infection, and a shorter return to work time. However, like other minimally invasive techniques, MED has a learning curve which is related to surgery time, complications, conversion to open procedures, and recurrent disc herniation. Chang X, Chen B, Li HY, Han XB, Zhou Y, Li CQ, et al. The safety and efficacy of minimally invasive discectomy: A meta-analysis of prospective randomised controlled trials. Int Orthop 2014;38:1225-34. Wu X, Zhuang S, Mao Z, Chen H. Microendoscopic discectomy for lumbar disc herniation: Surgical technique and outcome in 873 consecutive cases. Spine (Phila Pa 1976) 2006;31:2689-94. Mixter WJ. Rupture of the lumbar intervertebral disk: An etiologic factor for so-called “Sciatic” pain. Ann Surg 1937;106:777-87. Yasargil M. Microsurgical operation of herniated lumbar disc. Adv Neurosurg 1977;4:81. Iwa H, Caspar W. A microsurgery operation for lumbar disc herniation (author's transl). No Shinkei Geka 1978;6:657-62. Evaniew N, Khan M, Drew B, Kwok D, Bhandari M, Ghert M, et al. Minimally invasive versus open surgery for cervical and lumbar discectomy: A systematic review and meta-analysis. CMAJ Open 2014;2:E295-305. Foley KT, Smith MM. Microendoscopic discectomy. Tech Neurosurg 1997;3:301-7. Perez-Cruet MJ, Smith M, Foley K. Microendoscopic lumbar discectomy. In: Perez-Cruet MJ, Fessler RG, editors. Outpatient Spinal Surgery. St. Louis: Quality Medical; 2002. p. 171-83. Brock M, Kunkel P, Papavero L. Lumbar microdiscectomy: Subperiosteal versus transmuscular approach and influence on the early postoperative analgesic consumption. Eur Spine J 2008;17:518-22. Smith N, Masters J, Jensen C, Khan A, Sprowson A. Systematic review of microendoscopic discectomy for lumbar disc herniation. Eur Spine J 2013;22:2458-65. 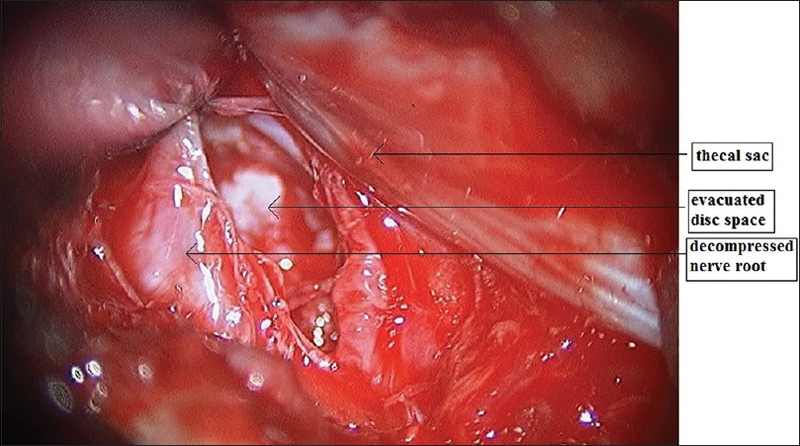 Ranjan A, Lath R. Microendoscopic discectomy for prolapsed lumbar intervertebral disc. Neurol India 2006;54:190-4. Jhala A, Mistry M. Endoscopic lumbar discectomy: Experience of first 100 cases. Indian J Orthop 2010;44:184-90. Kaushal M, Sen R. Posterior endoscopic discectomy: Results in 300 patients. Indian J Orthop 2012;46:81-5. Kulkarni AG, Bassi A, Dhruv A. Microendoscopic lumbar discectomy: Technique and results of 188 cases. Indian J Orthop 2014;48:81-7. Suezawa Y, Schreiber A. Complex indications in surgery of the lumbar spinal canal. Z Orthop Ihre Grenzgeb 1987;125:308-19. Macnab I. Negative disc exploration. An analysis of the causes of nerve-root involvement in sixty-eight patients. J Bone Joint Surg Am 1971;53:891-903. Mayer TG, Vanharanta H, Gatchel RJ, Mooney V, Barnes D, Judge L, et al. Comparison of CT scan muscle measurements and isokinetic trunk strength in postoperative patients. Spine (Phila Pa 1976) 1989;14:33-6. Sihvonen T, Herno A, Paljärvi L, Airaksinen O, Partanen J, Tapaninaho A, et al. Local denervation atrophy of paraspinal muscles in postoperative failed back syndrome. Spine (Phila Pa 1976) 1993;18:575-81. Burkhardt BW, Qadeer M, Oertel JM, Sharif S. Full endoscopic interlaminar lumbar disc surgery: Is it the gold standard yet? World Spinal Column J 2014;5:88-95. Forst R, Hausmann B. Nucleoscopy – A new examination technique. Arch Orthop Trauma Surg 1983;101:219-21. Kambin P. Arthroscopic microdiskectomy. Mt Sinai J Med 1991;58:159-64. Hermantin FU, Peters T, Quartararo L, Kambin P. A prospective, randomized study comparing the results of open discectomy with those of video-assisted arthroscopic microdiscectomy. J Bone Joint Surg Am 1999;81:958-65. Arts MP, Peul WC, Brand R, Koes BW, Thomeer RT. Cost-effectiveness of microendoscopic discectomy versus conventional open discectomy in the treatment of lumbar disc herniation: A prospective randomised controlled trial [ISRCTN51857546]. BMC Musculoskelet Disord 2006;7:42. Songer MN, Ghosh L, Spencer DL. Effects of sodium hyaluronate on peridural fibrosis after lumbar laminotomy and discectomy. Spine (Phila Pa 1976) 1990;15:550-4. Abitbol JJ, Lincoln TL, Lind BI, Amiel D, Akeson WH, Garfin SR, et al. Preventing postlaminectomy adhesion. A new experimental model. Spine (Phila Pa 1976) 1994;19:1809-14. Dasenbrock HH, Juraschek SP, Schultz LR, Witham TF, Sciubba DM, Wolinsky JP, et al. The efficacy of minimally invasive discectomy compared with open discectomy: A meta-analysis of prospective randomized controlled trials. J Neurosurg Spine 2012;16:452-62. Chou D, Wang VY, Khan AS. 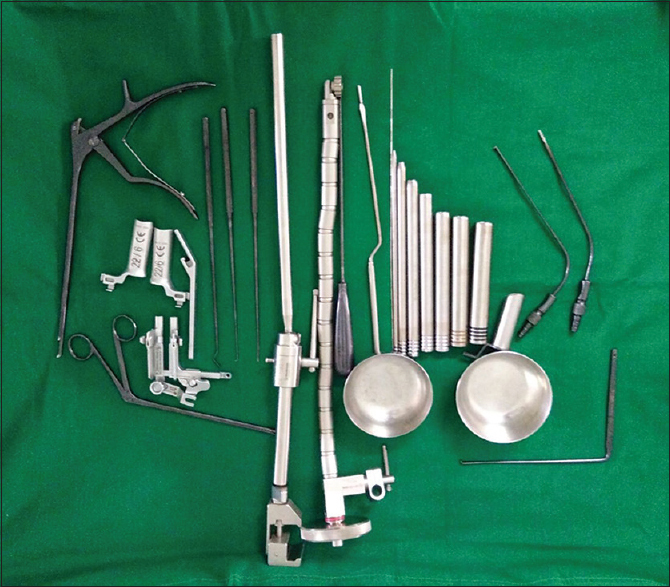 Primary Dural repair during minimally invasive microdiscectomy using standard operating room instruments. Neurosurgery 2009;64:356-8. Than KD, Wang AC, Etame AB, La Marca F, Park P. Postoperative management of incidental durotomy in minimally invasive lumbar spinal surgery. Minim Invasive Neurosurg 2008;51:263-6. Song D, Park P. Primary closure of inadvertent durotomies utilizing the U-clip in minimally invasive spinal surgery. Spine (Phila Pa 1976) 2011;36:E1753-7. Chen Z, Zhao J, Liu A, Yuan J, Li Z. Surgical treatment of recurrent lumbar disc herniation by transforaminal lumbar interbody fusion. Int Orthop 2009;33:197-201. Nowitzke AM. Assessment of the learning curve for lumbar microendoscopic discectomy. Neurosurgery 2005;56:755-62.